The Life in Papers of Sofie K.
My latest short story is out! 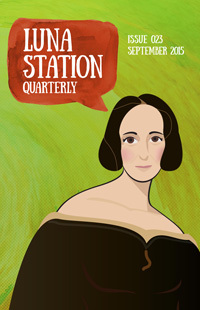 “The Tree of Life in Lisbon” is free to read over at Luna Station Quarterly. It’s a fantasy story about what happens after the Garden of Eden – more gardening, basically, and golems and apples and earthquakes. So much of my recent writing has been science-based that it feels almost strange to dip back into fantasy for a while. “I am disturbed,” said the Golem again. Eve heaved a sigh, and with her little carving knife sliced silence into the skin of a sweet, plump little grape and fed it to him, letting herself bask in the quiet. And the Golem did not speak and he did not nag, did not try to convince her to go out to market or to the hairdressers, to the puppet shows or the street musicians. The Golem was used to silence, had been fed it with olives and rose-water and seed pods, the muddy taste of mangroves, and he held the grape carefully on his tongue, carefully between jaws of clay, and waited to be told to spit it out. He was not capable of boredom, but Eve was.